The purposes of EMUN Conference are to encourage debate and to emphasise international awareness. Once again, and for the 7th year running, St. Alban's Senior pupils participated in this UN styled debate, which took place at St. Catherine’s Moorlands on June 23rd & 24th, representing different countries and organisations. We congratulate our students for their effort and global mindedness as well as their understanding of the great need of a better world. We would also like to congratulate our former pupils Pilar Moreyra and Valentina Grigera for their invaluable commitment towards this model as President of the General Assembly (PGA) and Academic Support Assistant (ACA) respectively. EMUN stands for ESSARP Model of the United Nations. The UN is an international organization that was set up after the Second World War had finished, in 1945, and is the second organization with more members in the World, right after FIFA. It is engaged in achieving world peace, together with several other aims, such as improving health conditions and helping children in difficult situations around the planet. Taking part in EMUN is one of the most valuable experiences I have gone through in 2018. This two-day event opened my mind to new ideas and gave me a different perspective on how the planet and diverse communities around it work. Some months before the event, which took place in late June, Ms. Martina Trucco and Mr. Teddy Tagliani gave us useful tips. Mr. Tagliani would show every new EMUN delegate a PowerPoint presentation that explained what EMUN and the UN were about. During this short lesson, he taught us how to get ready for it and what to expect once we were already there. Martina Trucco, on the other hand, would make each one of us do research on our own country, which in my case was Myanmar. I had to deal with non-state actors participations in education and the government action regarding terrorism. She would check how we were doing and see if we needed help in writing our resolutions, a long document that stated what the country's position about the issue was and what I, impersonating a Myanmar representative, considered needed to be done to improve the situation. A lot of work had to be done weeks before the event, and we received help and support from school teachers. The effort was worth it. The first day felt like being dragged into a mysterious parallel dimension. Everything was new and surprising and, although I was sure that at least one third of the delegates felt the same way, I could not help being nervous and scared. St. Catherine's Moorlands held the event. Staff members offered us croissants and breakfast as soon as we arrived. Once inside the classroom, the first person I talked to was the IOM delegate. During the informal lobbying, she suggested being allies. She did not have any luck, since my country was against immigrants. I finally gathered strength and courage to go and talk to other delegates by myself. I sat next to the Russian delegate and her allies and asked about their resolutions. It turned out it matched most of my country's points of view, so I stayed with them for the rest of the day. They were a nice group of people, friendly and with interesting ideas. For many of them, it was also their first ESSARP Model of the United Nations, so I could imagine to how they were feeling. By the end of the day, I felt confident enough to propose an amendment and stand up for it. In spite of what I believe was a convincing speech, my amendment was voted against and it did not pass. The first day was scary at first, but nice and cozy towards the end. When we entered the classroom on the second day, I felt much better than the previous time. I already knew who to look for and the issue we started discussing was one I found much easier. On several occasions I rose my hand to make “points of information” to the delegate who had the floor. Also, I was able to propose an amendment, which was voted in favour. I still remember how good I felt with myself when the majority agreed with my idea. At a certain point I decided to take out a pen and a copybook to write down notes on what the delegates were saying and scribbled some ideas I wanted to discuss. I felt very professional with my adult-like clothes (a blazer, a nice shirt and a skirt) and my notes of what my peers were saying. I learnt a lot about education worldwide and how to speak up for my ideas. You could see, on the second day, that the atmosphere was less tense and the use of time was more efficient. The resolutions were passed faster and there was spare time to make jokes and read the “confession box” and the “superlatives”. It was great fun when, almost at the end, we were given an imaginary situation to tackle and the Indian and Lebanon delegates began to argue, politely and respectfully, about their ideologies and why their countries had acted . I enjoyed the second day much more because I was not nervous and had a more active participation. 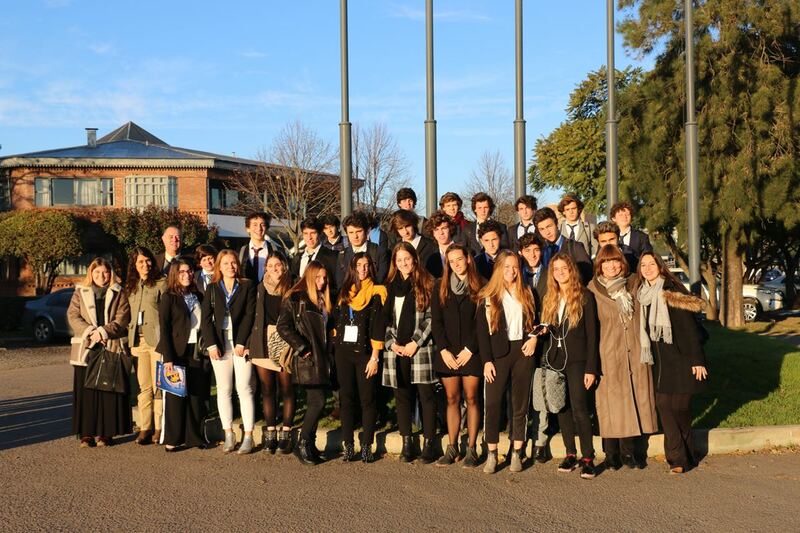 Overall, taking part in EMUN was a very nice experience, where I learnt a lot and made new friends. I would recommend younger people to participate and I will definitely join it next year.